Use these pure carrier oils as they are or use them as a base to add your favourite essential oils. Helps protect and soften the skin, soothe inflammation and calm the irritation caused by itchy skin. Avocado has excellent moisturising properties and is ideal for dry or mature skin. Nourishes and softens the skin, deeply moisturising without leaving the skin feeling greasy. Effective on bed sores, broken veins and inflamed gums and as a carrier for treating dry eczema. Blends well with hypericum. 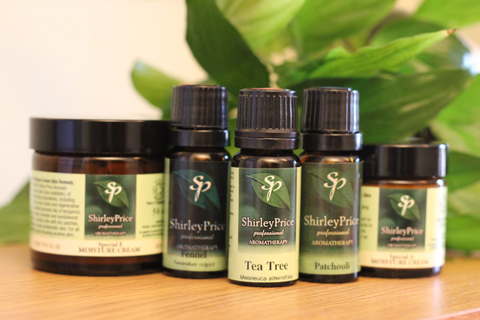 Shirley Price's own special blend of Grapeseed, avocado and wheatgerm. It penetrates the skin easily, leaving it feeling smooth and soft. Colourless oil, light and easily absorbed carrier oil. A staple for many massage therapists. A light, moisturising oil which is quickly absorbed into the skin, making it an excellent medium for massage without leaving the skin feeling too oily. Useful for cases of inflamed nerves so easing the symptoms of neuralgia and sciatica. Combined with calendula and essential oils it is very useful oil. Unlike many other carrier oils, jojoba is chemically very similar to human sebum- oil which our skin naturally produces. Nourishing to a dry skin. Moisturising oil, which will soften the skin. Very pleasant to use and an alternative to grapeseed. Ideal to blend with other carrier oils, it is useful for dry and mature skins and is a natural preservative.